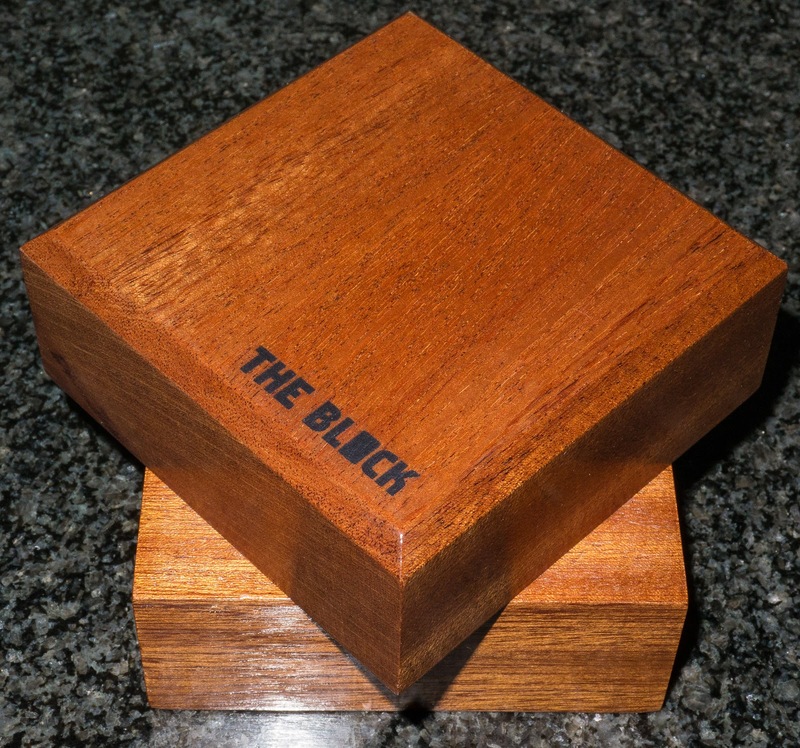 The Block - Look at the attention to detail! and you could have one too! More about that later. This little hobby of mine which has come to take up so much of my spare time and almost all of my spare cash has brought me together with a lot of fascinating people from all over the world. Puzzle solvers, collectors, craftsmen, designers, sellers and even book publishers! I enjoy every aspect of these communications and have kept every single email. Yep! Every one - a total of 1.4GB of emails! This interaction has expanded into Facebook too and I'm sure that Mark Z does not really intend that I use his baby that way. Despite all these conversations through many routes - with many occurring simultaneously I actually only get to meet a tiny proportion of these treasured friends face to face. Many months ago, Shane, whom I now consider a very good friend, emailed me via my contact page and initially we discussed his puzzling journey with some tiny hints for a couple of puzzles he was stuck on and then suggestions for future purchases and other things to try. I've put him in touch with another friend who was able to help him with another of those blasted non-functioning Sonic Warp puzzles which seem to be all over the place. Now it turns out that he has trained as a Master wood craftsman and subsequently owns his own business building everything from small home improvements to enormous grand designs specialising in, but not limited to, beautiful wood work. It did not take very much encouragement from me to get him moving from a few ideas he had in his head to an attempt to produce a prototype. We have emailed back and forth over several months sometimes about his creation and sometimes about other puzzles and at one point I put out an email to several other famous puzzle craftsmen asking how they like to finish their wooden puzzles and whilst everyone is different, Shane was able to take their ideas and formulate one that fitted with his puzzle. I love a puzzle with a series of instructions! 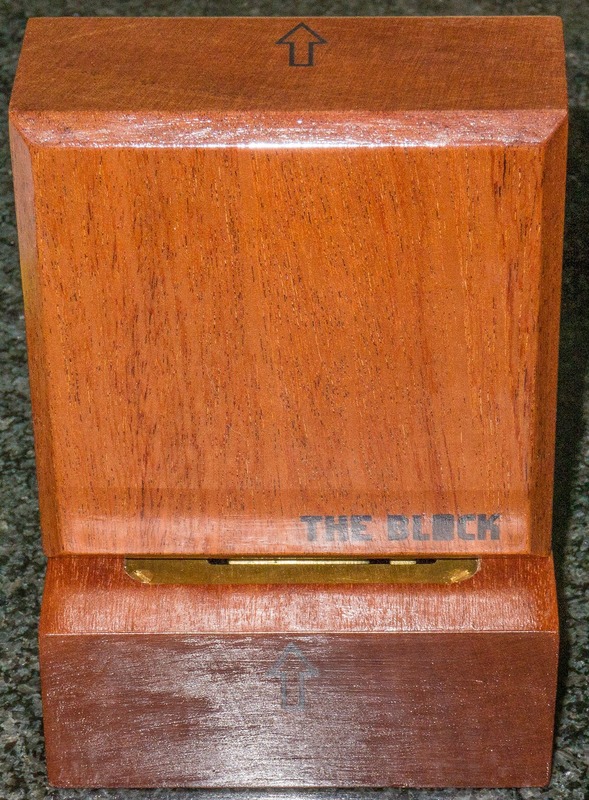 CAN YOU BEAT "THE BLOCK"? The Object of the puzzle is to separate the two halves. Now I had a little time before dinner to have a play. Picking it up revealed a very heavy puzzle - it certainly lived up to it's name - it certainly is a block. Dimensions are 10 x 9.8 x 8 cm. Just turning it around and about revealed that something or somethings were sliding about inside and it was not entirely wood - there was a distinct metallic clanging noise from within. The finish on it is gorgeous, Shane has chosen a highly polished lacquer finish and it is perfect. 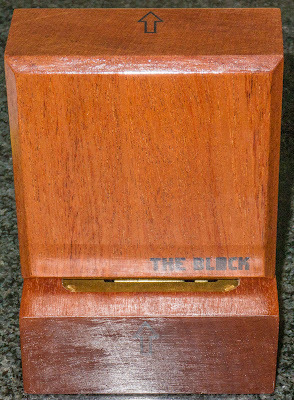 Plus it has been inscribed with it's name (note the solid O in the Block) and underneath the prototype number and a signature. I was delighted to see my name too. So... On to separate the 2 halves - my initial attempts revealed that there was only a tiny bit of wiggle room between the halves and no matter what I did I could not increase this. I even held it up to the light to see whether I could glimpse anything between the pieces. No luck there! I tried one of the puzzlers armamentarium of tricks and suddenly we had a little twisting movement! At this point it would appear that there is a maze inside and many of us are rather familiar with solving hidden maze puzzles. I got my pad of graph paper and proceeded to draw the map. Except... It was harder than expected! Firstly, due to it's size the centre point is quite a long way from an edge. This makes plotting accurately rather tougher than the revomaze. Also something was very wrong indeed - the block is not perfectly square and so the centre point doesn't seem to be the point where the pin is. Finally I realised that there's no pin! The maze works rather differently. Sometimes you can rotate and slide the top half and sometimes you can't. Sometimes it will rotate in one direction and sometimes it is blocked and will only rotate the other way. Whatismore occasionally sliding moves will happen but not be repeatable later on! Knowing a little about Shane's background, I formulated a theory about how it was functioning - it did almost explain the way the block functioned but I knew I didn't have it quite right because many times it just wouldn't do what I expected. I had to break for dinner! I didn't want to... but Mrs S would have taken the block from me and incorporated it into my head if I didn't put it down. Ouch!! Now there is a small flaw which Shane has acknowledged. In order to make it a manageable size there comes a point where you get a small glimpse of part of the maze - not a lot but a small part near the home stretch. This meant that I was able to solve the puzzle in about 90 minutes! Had this little peek not been possible then I reckon that solving it might have taken me days or weeks! Solved it! Now you can see a glimpse of some brass! Discussing this with him, Shane was hoping for a puzzle that would keep a puzzler going for 45-60 minutes and so he was very happy with my solve time. To be perfectly honest, I think that it was perfect - I wasn't wanting another revomaze experience of weeks and months of mapping - this was just the right amount of thought, discovery and mapping for me just now. When opened, I was able to see the mechanism that made it behave so strangely - I slapped myself on the forehead when I saw the incredible idea and how difficult it would be to guess it. Seeing it confirmed that without the glimpse of the maze, I wouldn't have stood a chance of solving it so quickly. The beautiful external workmanship continued on the interior - it also shows that his skills extend from wood to brass, steel and aluminium too. The quality of the finish is awesome! So what was in the "do not open until solved" envelope? Shane had made an acrylic version of the lid so that you can place it on and use that instead. Thus revealing why it was so difficult to map and so difficult to understand the odd behaviour. I think I played with that acrylic lid for several hours marvelling at how something so easy could become so difficult. It then came to time to reassemble - despite knowing the maze inside out, it still required considerable thought to navigate and put it back to the starting position. I have opened and closed it several times since then and still get a kick out of it - that is the mark of a very well thought out design. You all know that the present Mrs S insists that all my puzzles remain in my study. If one escapes into the living room it very rapidly teleports back onto my computer keyboard. Recently, only a very few of the most beautiful puzzles are allowed to stay on show and The Block is now one of them! The proof? Here's a photo of the centre of my coffee table with the only puzzles allowed outside my study!! 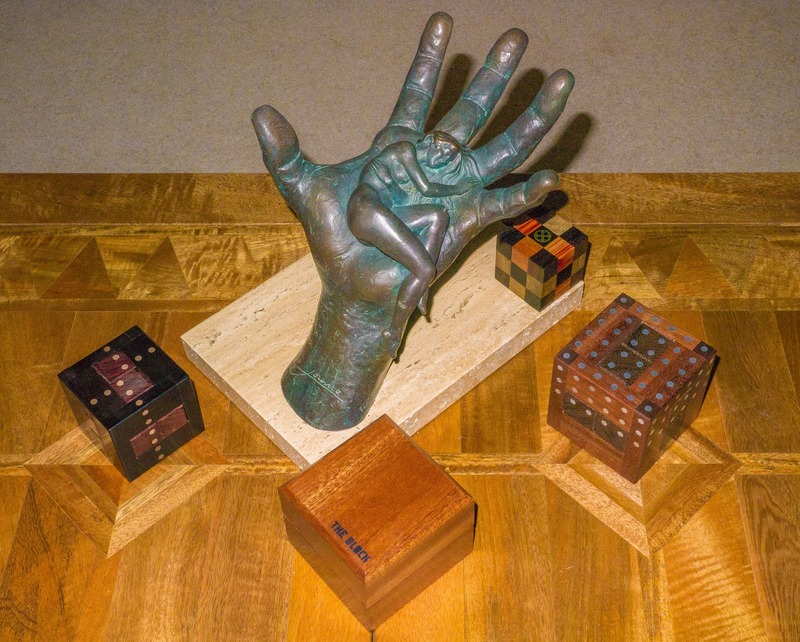 Coffee table art now includes puzzles! Well done Shane on a fantastic design, an amazingly beautiful puzzle and actually convincing Mrs S to let it stay on show. 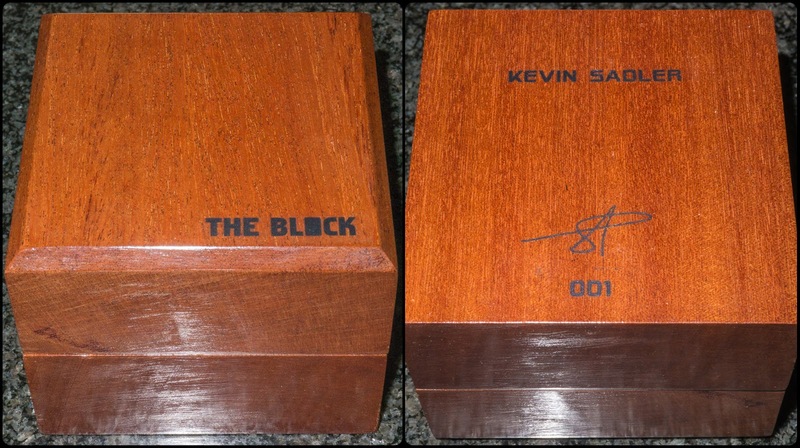 Thank you so much for including me in your design process and of course, thank you for letting me have The Block 001 - it is now one of my most treasured puzzles. Now this "prototype" has cost Shane quite a lot of time and money to produce - so much so that it is never going to be commercially viable and on top of that he did it for the fun of it and not for profit. Four copies were made and these are all that will ever be made. 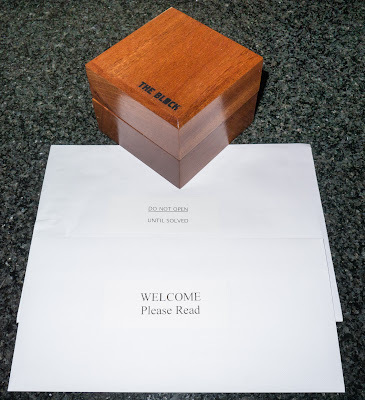 This means that there are 2 more which Shane would like to give to deserving puzzle people for their collection. He wants it to go to someone who would truly appreciate the work involved and not want to flog it off for a quick buck. We haven't fully decided how this should be done - it may be that if you have something interesting that you would like to exchange with him, then he will consider it. Alternatively (and more likely) if you can tell us (well primarily him) why you deserve it and why he should give it to you then he will just give it away. 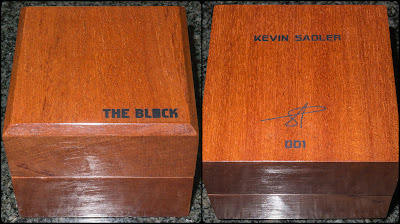 So if you have any thoughts on why you should become owner of The Block number 002 or 003 then please drop me a line via my Contact page or my email if you have it. We both greatly look forward to hearing from you. The pleasure has been ALL mine. See you at the next Midlands puzzle party! MPP 11 will be the grand unveiling! Have begun to receive nominations already! Interestingly, puzzlers are nominating other people and not themselves! I heard about this puzzle in the making from Shane a while back....it has come to fruition! Well done and congrats Shane! Give it Brian Pletcher so he will have something to review for his blog. Missing some "to"s, Anonymous #1? Brian is very much on the short-list! Decision has not been made yet! Sounds like an interesting puzzle, I'd definitely be interested in trying it! I could mail it around to other Renegades like we have done with some of Robert's boxes, so more people can give it a try.